New Textile Designs – Hit or Miss? Fab or Drab? Before I show you the three new textiles designs I want to update you on my first round of Spoonflower swatches. The swatches arrived last week and the colors and designs look Great! So I’m happy to announce that my Spoonflower Shop is officially open with my first designs, which offers international shipping too! 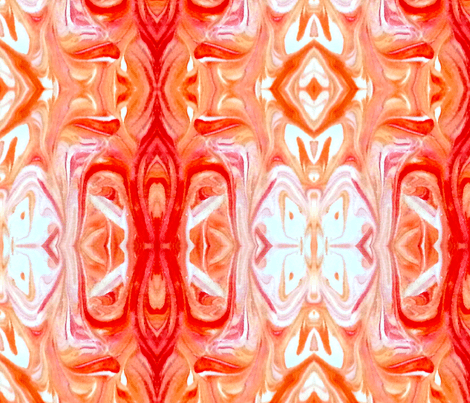 I’m in love with the marbling textile technique and look forward to hand painting many designs for clothing, handbags and I’m looking forward to making cushions too! I can manipulate the colors, lighting and capture the essences of my painting. I’m so happy for this technology that saves me time and allows me to move on quickly to my next hand-painted creation! It’s sooooo relaxing even for a person like me who hated the idea of painting. I always associated painting with staying within the lines of a design… My parents got me a paint by numbers kit when I was a child and it scared be for life! My painting didn’t look like the picture on the box and I couldn’t stay within the lines. So I never wanted to continue on that path. Here’s the video of the marbling technique that inspired me to find out more about this hand painting technique and designing my fabrics! I’ve experimented with different fabric painting techniques, but this technique allows me to blend colors and create designs based on my imagination and the best part is that it doesn’t have to be perfect! Besides that it’s quick, easy, and dries super fast… And I can order any amount of fabric I need, because it won’t be sold out! 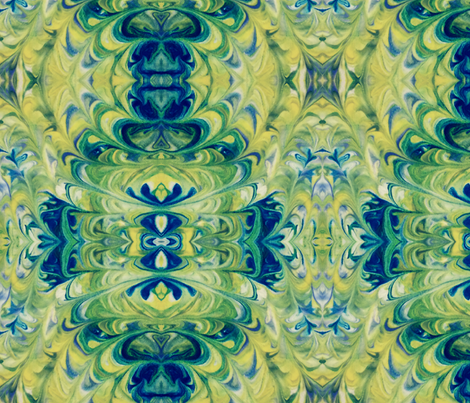 So on my second round of marbling the following new textile designs emerged! What Do you think? Are they a Hit or Miss? Fab or Drab? I started with this design…. 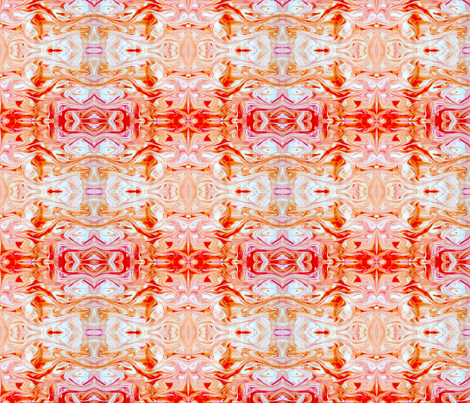 Orange is one of my favorite colors, but It’s been difficult to find a textile design that I like until now. 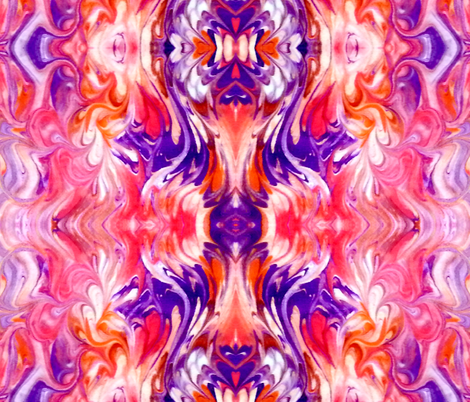 This second set of marble textile designs blended nicely with white and a touch of magenta paint. I manipulated the pattern on Spoonflower to create two tangerine designs along with wallpaper and gift wrapping paper too. Click on the fat quarter designs to see them on Spoonflower. The designs are in the review process so you may not see the wallpaper and gift wrapping options. Give your favorites a heart on Spoonflower and you can like or share your favorites on Facebook or Twitter! The Violet Fusion started with this design. Turquoise and Yellow Marble design started here. I transformed the design to this fat quarter swatch. More designs are coming soon and If you want to be the first to see them follow me on Instagram! I hope you gave your favorite swatch a heart on Spoonflower. Beautiful! Congrats and a definite Hit. Love the colors! love the colors and the designs. I never really thought of marbling my own fabric. This is so cool.